Services, Auburn, CA | Sterling P Holloway Inc.
Sterling P. Holloway Inc. knows that a small company can accomplish a lot. 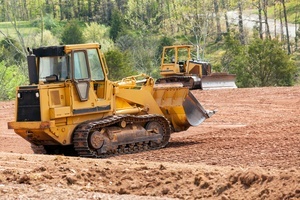 Based in Auburn, CA, we offer a wide variety of different types of excavation for industrial and commercial customers. Over the years, we have assisted everyone from homeowners to state department heads on a variety of projects. We have hydraulic breakers that are mounted on hydraulic excavators, along with bucket and thumb combinations to handle projects of any size or scope. Our breakers range from 1,200 to 15,000 pounds of striking force. With this highly productive equipment, we specialize in concrete breaking, as well as structure and bridge demolition. We also have loaders, end-dumps, and a backhoe, which are available for land clearing and debris hauling. Our field demolition teams (Operating Engineers Local 3) (Northern California Laborers Local 185) are ready to assist you with emergency response services, or we offer rental services for all of our equipment at reasonable rates. Our company has been accredited by the Better Business Bureau since October 2013, and our goal is to ensure your complete satisfaction with every project we undertake. Have a look at some of our past projects or reach out to us today for a project quote. Get in touch with us today at 530-878-1800 and let us know the details of your project.